LINCOLN PARK — A grass-roots group is working to create a food truck park near the Fullerton "L" stop with hopes of ending what it calls a lack of healthy food options in the area. 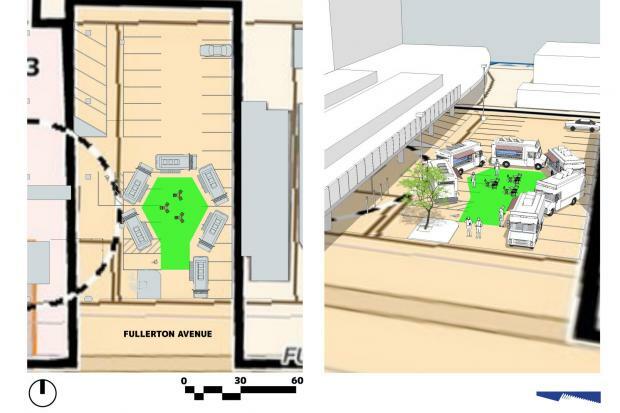 The proposal is in the very early stages, but it calls for sectioning off a portion of a private parking lot adjacent to the "L" stop for a few hours a day to make room for a mobile sustainable market. It would be a hub for food trucks and host other sellers who could set up temporary stands, such as Etsy artists and bike mechanics. The parking lot, which is owned by DePaul University, could even serve as a space to sell produce from the school's own urban garden. "There are food deserts in the city. That's a common buzzword, but in some respects even in Lincoln Park there's a deficiency of healthy food," said Jim Gramata, a Lincoln Park builder who is working with architect William Huchting on the project. This parking lot directly east of the Fullerton "L" stop could become the site of a food truck lot. "We want to engage the community and ask what are some needs you see coming off the train at night or on the weekends?" he said. The pro bono project seeks to answer the question of "How can we have more healthy food options in Lincoln Park?" For many DePaul students and residents in the area without cars, getting to healthier options is difficult. The location Huchting and Gramata are focusing on sees heavy foot traffic and has little competition in the surrounding area, especially with the recent closure of Dominick's at Sheffield and Fullerton avenues. "It sort of all clicked," Gramata said. 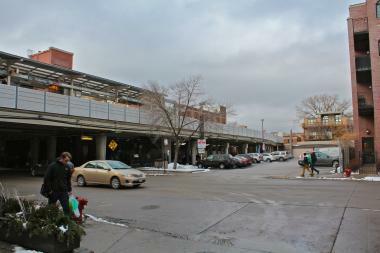 "We have a high-traffic area at the Fullerton 'L' stop and a private lot right next to it. It was a no-brainer." The private component could be key, as it would allow food trucks to operate outside the strict city guidelines that have hampered many operators. Recently, Mark Alex, who operates the Cupcakes for Courage food truck, parked along Fullerton Avenue just west of the "L" stop for the first time. He and the owner of the truck heard the area was hot. More trucks have been visiting the area around DePaul in the last few months, but Alex said a dedicated area for multiple trucks would be a huge boost for business. "It would be perfect," he said of the new proposal. "It would help us out and help" students out. Only a small portion of the front of the parking lot would be used for the food truck lot, and according to observations by Huchting and Gramata, no more than 20 percent of the parking spaces are occupied during the times the market would be open. One plan would involve installing Astroturf in the parking lot and setting up tables surrounded by a ring of trucks and pop-up stands. The two said they already have met with an administrator in DePaul's sustainability department, and are writing up an official proposal. However, in a statement, DePaul said the proposed location is "an active and well-used parking lot," adding "we need as many parking spaces as possible for our students and employees." A spokeswoman said there are "no plans to change." The men behind the project see the idea as a form of placemaking, similar to the "people spot" in Lakeview that serves as a park in a space smaller than two parking spaces, an the urban garden that DePaul created in a vacant lot. There are ways of reworking public spaces requiring little to no infrastructure, they said. "It's not so much about hardware. It's about what can we actually do with very little in terms of resources," Huchting said. "What can we do that wouldn’t require 10 years, wouldn’t require a bond issue?" Huchting and Gramata seek to grow their Sustain Illinois initiative from its start in Lincoln Park to projects throughout the city. They said that if the food truck stand is successful on Fullerton Avenue, there is no reason it couldn't be replicated at other "L" stops. "There's sort of a connected circle between sustainably grown, locally grown and produced goods, and where they are distributed," Gramata said.